Dutch forward Elia got his first goal in England when he fired under Tim Krul after James Ward-Prowse's pass. Newcastle equalised when Saints defender Florin Gardos's clearance hit Yoan Gouffran and spun into the net. Elia made it 2-1 when his deflected drive beat Krul before Newcastle saw a late penalty appeal dismissed when Jose Fonte handled Emmanuel Riviere's shot. 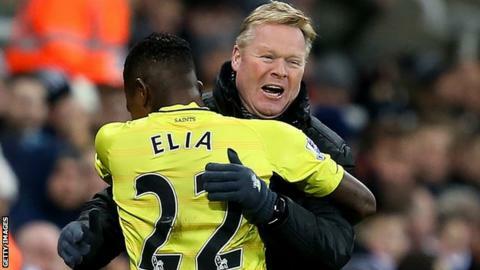 Elia moved to St Mary's on loan from Werder Bremen at the start of January and helped Ronald Koeman's team to victory over Manchester United on his debut. Netherlands international Elia gave his new club an ideal start at St James' Park by beating two of his compatriots to score his first Southampton goal. Ward-Prowse's threaded pass released Elia, who held off the challenge from Daryl Janmaat before firing the ball under goalkeeper Krul, who should have saved the shot. Southampton's previous win at St James' Park came in 1997, when Matt Le Tissier was on the scoresheet. Fonte went close to doubling the visitors' lead but headed over from Ward-Prowse's swirling free-kick from the right. Newcastle's John Carver is yet to win a match since taking over as caretaker manager after Alan Pardew left for Crystal Palace on 3 January. Gardos slid to meet Remy Cabella's through-ball but the Southampton defender's clearance hit Gouffran's knee and the ball spun into the unguarded net. It was the Frenchman's first goal in 13 months. The goal lifted Newcastle and they came close to taking the lead when Cabella's fine chipped pass found Ayoze Perez but the 21-year-old Spaniard's half-volley drifted narrowly wide of Fraser Forster's left-hand post. Gouffran glanced a header wide from 10 yards after Massadio Haidara's cross and, less than a minute later, Newcastle were behind again. Newcastle defender Paul Dummett headed wide from Jack Colback's corner as the hosts struggled to regain their rhythm. Newcastle were denied a late chance to equalise when a shot from substitute Riviere hit Fonte's arm in the area but referee Robert Madley chose not to award a penalty. Southampton manager Ronald Koeman: "When I got the question pre-season, if they said to me after 22 games you would be third maybe I would be laughing. But we don't steal points, we play good football. "Of course you need some luck but the spirit is unbelievable, and the confidence, like you saw today, they are confident in themselves. They know exactly what they have to do, and even when we do not play well we keep the organisation and that is the key to being successful." Match ends, Newcastle United 1, Southampton 2. Second Half ends, Newcastle United 1, Southampton 2. Attempt blocked. Emmanuel Rivière (Newcastle United) right footed shot from outside the box is blocked. Assisted by Rémy Cabella. Corner, Newcastle United. Conceded by Nathaniel Clyne. Attempt missed. Rémy Cabella (Newcastle United) left footed shot from the centre of the box misses to the left. Assisted by Sammy Ameobi with a cross. Attempt missed. Sammy Ameobi (Newcastle United) header from the centre of the box misses to the right. Assisted by Rémy Cabella with a cross. Attempt blocked. Rémy Cabella (Newcastle United) right footed shot from outside the box is blocked. Corner, Newcastle United. Conceded by Jose Fonte. Attempt missed. Rémy Cabella (Newcastle United) right footed shot from outside the box misses to the left. Assisted by Sammy Ameobi following a corner. Substitution, Southampton. Matt Targett replaces Eljero Elia. Substitution, Newcastle United. Michael Williamson replaces Paul Dummett because of an injury. Foul by Harrison Reed (Southampton). Attempt saved. Harrison Reed (Southampton) right footed shot from the left side of the box is saved in the centre of the goal. Assisted by Graziano Pellè. Attempt blocked. Graziano Pellè (Southampton) header from the centre of the box is blocked. Assisted by Nathaniel Clyne with a cross. Attempt missed. Paul Dummett (Newcastle United) header from the centre of the box is close, but misses to the left. Assisted by Jack Colback with a cross following a corner. Corner, Newcastle United. Conceded by Shane Long. Corner, Newcastle United. Conceded by Graziano Pellè. Corner, Newcastle United. Conceded by Florin Gardos. Offside, Southampton. Eljero Elia tries a through ball, but Graziano Pellè is caught offside. Attempt blocked. Emmanuel Rivière (Newcastle United) right footed shot from the left side of the box is blocked. Assisted by Sammy Ameobi with a cross.